Enter to win two Evo Hemp Bar Variety Boxes, featuring all their delicious flavors in one box: Cashew Cacao, Cherry Walnut, Mango Macadamia, Apple Pecan, Cacao Dragon and Pineapple Almond. You’ll also win two Evo Hemp Protein Supplements which offer an easy to digest, complete plant-based protein that’s supported by raw enzymes. 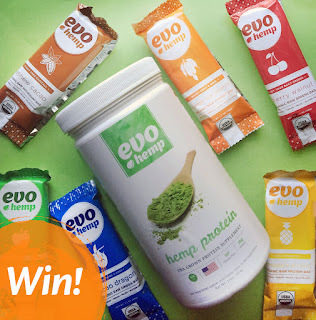 In fact, Evo Hemp offers and amazing 15 grams of plant-based protein, 7 grams of fibre, and 2.6 grams of omega-3 and omega-6 per 30-gram serving. Plus, this superfood has a mild nutty flavor that's easy to add to baked goods like muffins, pancakes, and bread. The winner will also receive a $25 VISA gift card for summer fun! Package worth about $100! If you love subscription boxes or just would like to try a few new products, check out the HEMPBOX options! They offer 3 sizes and price ranges that can fit everybody's budget. Evo Hemp also offers variety packs and sample packs for new fans! I am anxious to try the BBQ, Garlic, and Cinnamon Hemp Crunch! This would be perfect to add to quark, yogurt, eat by themselves or add to a fruit and cheese tray for guests. Even if you don't win, they have 20% discount code on their site for your first order! I'd like to try pineapple almond. I would love to try the Barbecue Hemp Crunch. It sounds delicious! I want to try the Cherry Walnut Bar! I would love to try the cinnamon hemp crunch! I want to try the Cinnamon Hemp Crunch. Oh those Apple Pecan Hemp Bars sound amazing! I would try that one first! I want to try the cherry walnut bars.